With the end of 2016 drawing near, we would like to take the opportunity to share the views of our reviewers. Last September, we asked our reviewers for feedback on the peer-review process at eLife in an anonymous survey. We were interested to know if our process is being realised as intended, and if reviewers feel we’re achieving the benefits we’ve hoped we would. By design, eLife’s approach to peer review requires more involvement from reviewers initially, in order to improve the quality of decisions that reach authors and save time for authors and reviewers by avoiding unnecessary rounds of review and revision. So, do reviewers think it works? To investigate, we invited everyone who’s completed one or more reviews for eLife (6,500) to respond via anonymous survey, and received over 1,000 responses. Broadly reflect the population of submitting authors, by discipline (Fig. 1). Were relatively new to our process, with 623 people reviewing for us just once by the time of the survey. The most prolific reviewer in the survey had completed 10 reviews for eLife. Were concentrated in the United States (50%) and Western Europe (11% UK, 8% Germany, 5% France), with a small proportion representing countries from across the globe. There were 77% male and 21% female respondents (2% declined to answer). Figure 1. 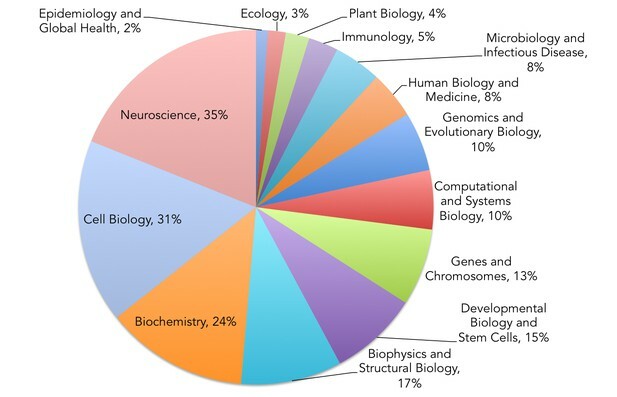 Breakdown of reviewers survey respondents by discipline. The majority of respondents (79%) were familiar with our approach to peer-review before getting started. 92% said the process was explained clearly before they completed their reviews. Reviewers mostly say they had a good understanding of the quality eLife seeks to publish before they reviewed. 27% said they fully understood, followed by 35% who felt they understood the quality required to a high degree. A fifth of the reviewers were unsure about the level of quality expected by eLife before reviewing. After their first review experience, just 3% will still unsure. 95% of our reviewers believe the consultation is valuable to authors. A majority agrees that the consultation allows for all involved to have a fair opportunity to contribute (94%). 89% of reviewers feel the discussion between reviewers leads to a fair decision, and 84% also feel that the consultation helps to identify the essential revision requirements. 97% of reviewers take active part in the consultation process. 90% feel that openness amongst reviewers during consultation benefits the process. 38% of reviewers agreed in principle with revealing their identity to the authors of accepted papers. 16% agreed in principle with making themselves known to the authors of rejected papers. ( Note that eLife monitors reviewers’ practice separately.) 53% of our reviewers are still not ready for their identities to be known to authors of papers they reject. This proportion has decreased from 62% in our 2015 survey.